Not all researchers agree that listening to music helps cognition and math skills, but enough studies show a correlation on how it might benefit students struggling to keep up with their peers. In fact, Einstein used to sit and play music when he was stuck on a mathematical problem. By concentrating on the problem at hand (left brain) while playing the piano or violin (right brain), he was able to strengthen the communication between the two hemispheres of his brain and increase brainpower. Exactly how much students benefit may depend on the type of music they listen to and whether they choose to learn how to play instruments. Some research finds that music activates the same areas of the brain that subjects use while solving spatial-temporal reasoning problems. Based on extensive research and knowledge that certain types and frequencies of sound are processed by the two hemispheres of the brain differently, using specific music and sounds may help to stimulate one hemisphere more than the other and possibly create more balance in the brain. As such, listening to music could improve a student's cognition and ability to learn math skills. As recently as 2012, one study showed that listening to music during a math test could improve performance by 40 percent. While listening to enjoyable music may improve cognition and math skills, performing music offers more advantages. 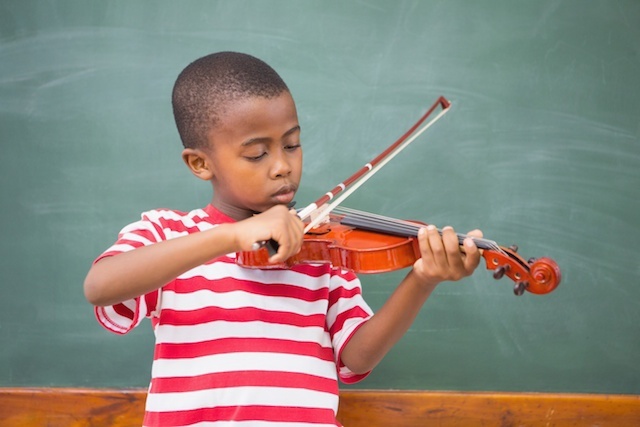 Learning music improves math skills because, at some level, all music is math. It's about time signatures, beats per minute and formulaic progressions. Performing music, therefore, reinforces parts of the brain used when doing math. Studies even show that children who play instruments are able to complete complex mathematical problems better than peers who do not play instruments. Students who commit themselves to learning an instrument may also learn other skills that help them perform better in school. It takes a considerable amount of patience to practice scales, and children who apply similar patience to doing schoolwork will have an advantage over those who don't. Fine motor skills are also improved by playing musical instruments. Taking time to appreciate music is a reward on its own. For the teachers and parents trying to help children succeed, that time could also improve math and academic skills.